Vidisha Barua Worley and Robert M. Worley, Editors. 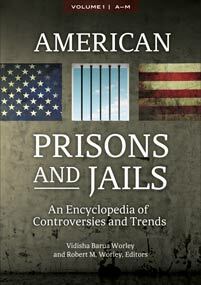 American Prisons and Jails: An Encyclopedia of Controversies and Trends [2 volumes]. ABC-CLIO, 2018. ABC-CLIO, publisher.abc-clio.com/9781610695015. This two-volume encyclopedia provides a comprehensive and authoritative examination of the history and current character of American prisons and jails and their place in the U.S. corrections system.